Not visible from the highway, there are some very big mountain ranges in the backcountry between Smithers and Terrace. Some of them are accessible from the highway, but the Howson Range is usually accessed by air as ground access is long and often requires a snowmobile. The Rocher Deboule Range stretches from Moricetown to Hazelton, dividing the Bulkley from the Skeena valley. These mountains are steep sided and have demanding terrain. The snowpack is a bit colder and shallower than further west and south. The Howson Range is the highest and most easterly range of the Coast Mountains in this area. While the absolute elevations are relatively modest (Howson Peak rises to 2,759 m), the relief is very large and the mountains are heavily glaciated. This is very big and serious terrain, easily comparable to the country around Fairy Meadows, but with better skiing and, very importantly, great poor weather tree skiing. Trips are usually based out of the Burnie Glacier Chalet. The area is protected in Burnie-Shea Provincial park and designated non-motorized. 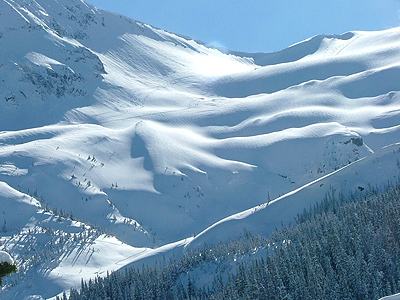 East of Smithers, the Babine Mountains offer interesting ski touring in smaller terrain. The snowpack is rather cold and shallow compared to areas further west, but particularly in the Spring, it is worthwhile to spend some days there. The Joe L'Orsa cabin in Babine Mountains Provincial Park is a beautiful base. We want to hear about your adventures in the Coquihalla Highway region so don’t forget to post a trip report in the Backcountry Skiing Canada forums. If you have a new route in the area you want to share, mouse-on over here. The routes below were provided by Christoph Dietzfelbinger of Bear Mountaineering & the Burnie Glacier Chalet. If we have missed anything please let us know. This is a high alpine tour around the Polemic group. It involves some steep terrain to 50 degrees, and travel through some crevassed glacier sections. From the Burnie Glacier Chalet, head up along the N side of the Burnie Glacier. At 1600 m, there is a steep section to circumnavigate a large icefall. Bootpacking is sometimes required. The glacial section above this step is crevassed. 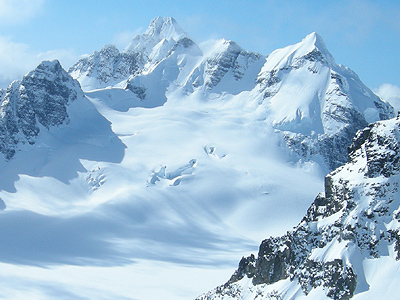 At 1900 m, the route gains the gentle upper neve of the Burnie Glacier underneath Kitnayakwa Peak. Head S into Polemic Pass (2,200 m). Traverse the Sandpiper's Loft toward the SE to circumnavigate the icefall of the Loft Glacier and gain the run from Loft Peak. At 1400 m, traverse S and ski the steep slopes of Lower Ptarmigan to the valley bottom. Follow the river to return to the lodge. From the Burnie Glacier Chalet, head SW across the valley and cross the old lateral moraine. Pick up a forest trail that traverses toward the Loft Glacier drainage. Gain open terrain in a bowl at 1200 m. Leave this bowl toward the S and then work gentler terrain toward the Loft Glacier. Loft Peak is 2,200 m and can be reached on skis. For the descent, traverse right at 1400 m to gain steep open slopes underneath Lakehead Peak and ski to the valley bottom. Follow the river back to the lodge. 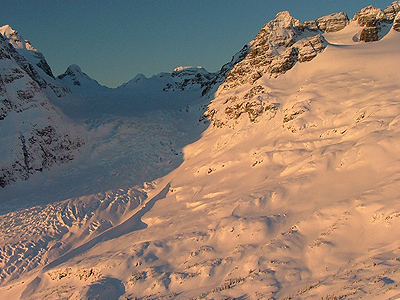 From the Burnie Glacier Chalet, head N to gain the gentle terrain between Tom George Mountain and the Solitaire Glacier. Head toward the rock buttress at the foot of Pass Mountain and then traverse W to gain the gentle Solitaire Glacier. The Solitaire Ski Peak (2,200 m) is beside the characteristic Stinkhorn at the head of the glacier.